The BONSAI URN is the eco-friendly portable cremation urn which gives you a new option to honor your loved ones cremated remains with continued memories. The Bonsai Urn is eco-friendly and is designed to inter the cremains of people and pets. As displayed above in Beige, the Bonsai Cremation Urn is available in either White, Beige or Celadon Blue, please select your choice on the next page. Approximately 13 years old when preserved, approximately 10″ tall by 15" wide when planted in Urn. Keep indoors. Includes decorative stones to place on top of the Urn. The BONSAI URN is designed to grow a living or preserved memorial in your loved one’s honor inside or outside your home. 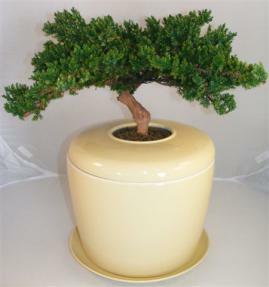 The Bonsai Urn features a round porcelain ceramic pot measuring approximately 9” high and 9” in diameter and includes our patented growing system of interlocking ring trays along with accessories (mixing cup and stirrer) to assist in the planting process should you desire to utilize a live Bonsai Tree in the future. The hand crafted porcelain BONSAI URN gives you a "portable green solution" to memorialize your loved ones with a simple, attractive way to grow this Bonsai Tree from cremated remains in a compact, portable ceramic pot with a patented growing system inside. No worries about moving, renting or outside growing spaces. Should you desire to utilize a live Bonsai Tree in the future, the Bonsai Urn can be placed indoors near a window, grow lamp or outside on the patio, deck or special garden area. The patented integrated growing system has separate chambers to hold the Bonsai Tree, cremains and growing medium.